Do you have an RV, a boat, or large furniture that needs a safe and secure home away from home? The team at Vines Storage in Redlands can help. We understand there is often simply not enough space for all of these investments. This can cause people to worry or reconsider their purchases. There is no reason to fret or sell a beloved vehicle, watercraft, or sofa. We can store all of them at our facility. We provide indoor as well as outdoor storage for RVs and other vehicles as well as boats. We highly recommend our indoor storage area to ensure the utmost protection. In addition to storage for vehicles and watercrafts, we have self-storage units. This makes it convenient to have everything you need when you need it in one location. Our self-storage units range in size comparable to closet spaces all the way up to two-car garages. These units can be ideal for families who are moving from a larger home to a smaller one or a couple who is beginning their new journey together in a tiny apartment. We know family vacations are important to residents in the Redlands area. From camping in RVs to boating on the lake, there are plenty of recreational activities to enjoy. We make it as convenient as possible for families. When the time comes to hit the lake, they can simply hook their boats to vehicles and drive off. There are typically no extra stops required before a vacation in the RV because we provide ice, purified water, waste dump facilities, battery chargers, and compressed air. We also offer RV detailing and washing for a nominal fee. We are located off Interstate 10 Freeway on the east end of Redlands near Lake Arrowhead and Big Bear, popular vacation destinations for our customers. We are the only self-park RV storage facility in Southern California. 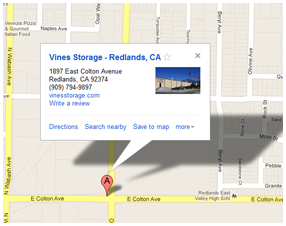 To learn more about why we are a top choice for customers in the Redlands area and beyond, call Vines Storage today at 909-389-6209. We offer short-term and long-term leasing options to meet various customer needs. We would love to talk with you to help you find the ideal storage solution for your RV, boat, or furniture.